While most parts of the Houston landscape are remarkably flat, properties that border Buffalo Bayou and its tributaries often have a hilly terrain. With some basic hill landscaping ideas, and the help of Exterior Worlds, you can watch these areas can be transformed into some of the most attractive features of your yard that your children, family members, and guests will immediately be drawn toward. The slope of the terrain often plays a key determining role in the viability of any given hill landscaping idea. Aesthetic interests have to be balanced with the practical need to prevent soil erosion. Gentle slopes are usually used to expand the sense of space. Steeper slopes require special development and normally wind up creating keynote points of interest in addition to playing very critical functional roles in soil retention. For a very gradual and gentle slope, elaborate drainage systems and soil retention methods may not be necessary. Something as simple as turf or even ground cover over the ground, can often protect a hill’s shape with a very subtle softscape design that compliments surrounding gardens and lawns. One of these simple, yet highly decorative hill landscaping ideas may be all that you need to draw your guest’s attention up to the tree line that grows along the bayou. This expands your property into the greater Houston landscape beyond, and it brings a sense of vastness and freedom that your friends and family will absolutely love. For steeper hills, we typically are faced with more challenging situations that require us to proactively address the issues of water runoff and soil retention without interfering with the aesthetics we are looking to create. 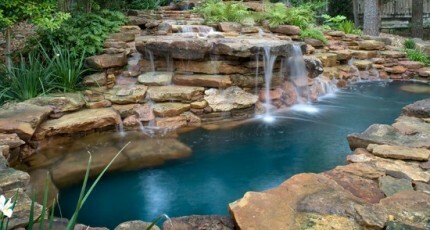 Our best friends in such an undertaking are retaining walls, special stairways, and waterfall design. 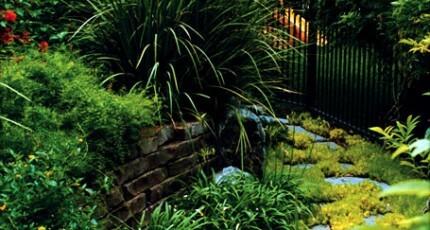 One hill landscaping idea based on the retaining wall concept is that of the terraced garden. This is done by carefully removing small portions of the hill to create ascending steps, then using small masonry walls to retain the shape and grade of the stops. Since the majority of the soil has been retained to create this form, there is ample planting room for a plethora of plants, flowers, or even vegetables. Once root systems form, the soil tightens even more and the hill becomes virtually rock solid against the elements. Another hill landscaping idea involves building a stairway out of steps that span the width of the hill and lead up to a patio seating area. These steps are either made from concrete, stone, or pressure treated wooden. Not only are they longer, but they are also wider than normal staircase steps. This allows us to build something that you can comfortably walk across much like a sidewalk, and that you will only have to step up a couple of inches to ascend. Not only is this comfortable, it is an excellent way to drain water sideways off the ends of the steps and prevent it from running directly down the hill and taking the soil with it. One of the most popular decorative hill landscaping ideas takes an entirely different approach to this issue of water runoff. This method uses the natural path that water normally follows down the hill as a channel for waterfall design. Water likes to follow the same path time after time. Simply by placing the right type and sizes of rock along these paths, we can create a guided course for rainwater to follow. Some people prefer to let nature furnish them with the waterfall only when it rains. However, if you want to enjoy your waterfall throughout the year, rain or shine, we can install silent, remote, and hidden pumps that maintain a constant flow. We can also build the falls with hidden drains so that they swell just a bit, much like natural streams, when it rains, but never overflow because there are hidden controls always working behind the aesthetic veil of the landscape design.